Private collection, America, c. 1965; (sale, Sotheby's, New York, 10 May 1985, no. 204). (Michael Hall Fine Arts, New York); purchased 8 September 1989 by NGA. 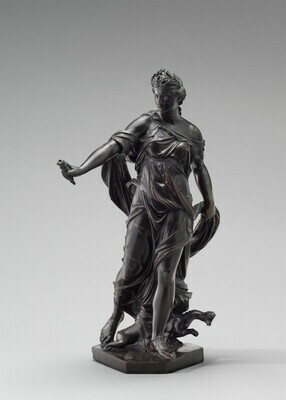 Bronzes Français de la Penaissance au Siècle des lumières, Musée du Louvre, Paris; The Metropolitan Museum of Art, New York; The J. Paul Getty Museum, Los Angeles, 2008-2009, no. 57, repro. Radcliffe, Anthony. European Bronze Statuettes. London, 1966: 109, pl. VII. Europäische Barockplastik am Niederrhein. Grupello und seine Zeit. Exh. cat. Düsseldorf, 1971: 351-352, no. 320, pl. 209. Souchal, François. "La Collection du Sculpteur Girardon d'après son inventaire après décès." Gazette des Beaux-Arts 82 (July-August 1973): 17, 50. Wardropper, Ian. "Michel Anguier's Series of Bronze Gods and Goddesses: A Re-examination." Marysas 18 (1976): 23-36. Sculpture: An Illustrated Catalogue. National Gallery of Art, Washington, 1994: 22, repro. Dabbs, Julia Kathleen. "Embodying Ethos: Anguier, Poussin, and the Concept of Corporal Expression in the French Academy." Ph.D. dissertation, University of Maryland, College Park, 1999: 25-26, 48, fig. 11. Penny, Nicholas. "The Evolution of the Plinth, Pedestal, and Socle." In Collecting Sculpture in Early Modern Europe. Nicholas Penny and Eike D. Schmidt, eds. Studies in the History of Art 70, Symposium Papers 47 (2008): 480 n. 57. Warren, Jeremy. Beauty & Power: Renaissance and Baroque Bronzes from the Peter Marino Collection [Catalogue of the Peter Marino Collection, Volume 1]. London, 2010: 150-157, fig. 2.